What is the allure of backcountry travel and recreation? For many it is the unknown, the sense of facing uncertainty and overcoming. There is a challenge in going to an unfamiliar place and surviving. The challenge is thrilling and enlivening. There is always an inherent amount of risk. The key is keeping the level of risk manageable. There are many tools used by outdoorsman to manage risk and overcome challenges. Wearing proper clothing, carrying shelter, using a water filter, and having a fire source are all essential, fundamental ways of overcoming obstacles. But perhaps the most fundamental and clearly necessary tools are the map and compass. 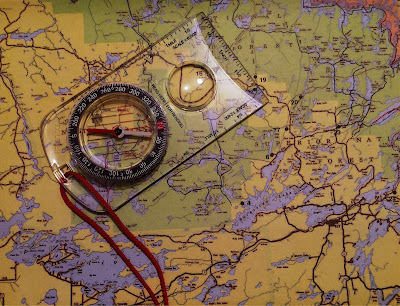 The map and compass are what make outdoor travel possible. They have been in use for thousands of years. They are still in use today, perhaps more than ever before. Today the map and compass may look different but are still used together in a digital form called GPS. There is a map on the screen and an electronic compass telling direction. Map and compass are so fundamental for good reasons. They enable us to travel to a previously completely unknown destination and find our way as if we have been there a dozen times. A skilled navigator can even get completely lost in the wilderness and pinpoint their location on a paper map with observation of the surrounding area. Map and compass or GPS allow us to travel confidently into the unknown because we trust the information they provide to be correct and reliable. Another word for trust is faith. Hebrews 11:1 says faith is the evidence of things not seen. Faith is trusting that the Map and Compass for our life are correct and reliable. When we read the Bible stories about God's faithfulness we can have trust or faith that his promises are reliable. The more we follow the paths and trails on a map, the more confident we become that the map and compass are trustworthy. As we walk the Christian path we learn from experience that God’s Word is faithful. As our faith grows, it becomes the assurance of things we hope for such as heaven and Christ’s soon return. As we experience God’s steadfastness to his followers our faith becomes the proof of things we cannot see such as God’s providence and protection. Have you ever had to rely on a map and compass or GPS? If so, did you doubt their accuracy? Or did you doubt your ability to use them? Have you ever doubted the reliability of God’s Word? Or maybe you doubted your ability to have faith in God’s Word? Do you long to have the type of faith described in Hebrews 1 that gives hope for things not seen? What can you do to improve your faith in a map and compass? What can you do to increase your faith in God and his Word?